Perhaps the most remarkable things about the Electrify Africa Act of 2015 are that it commits the US to increased foreign aid at a time of economic uncertainty and cuts through sharp political divisions. The Republican chairman of the House Foreign Affairs Committee, Ed Royce, worked with Democrat Eliot Engel for two years to drive the bill through Congress. 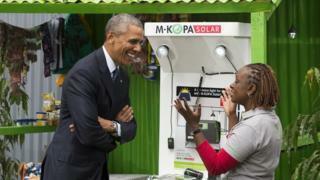 The act commits the US government to supporting President Obama's Power Africa initiative. Although headlined as a $50bn (£36bn) scheme, the US authorities will contribute just $7bn. Other governments, development agencies and private sector companies are expected to provide the remainder in public-private partnerships. This will be difficult to achieve during a global economic downturn. So the Power Africa initiative is not a magic bullet, but it has at least highlighted Africa's power supply problems. It is easy to take electricity for granted. Most African homes lack fridges and electric cookers but even a single electric light bulb can bring security and allow children to do their homework after dark. Connection rates in rural areas are typically worse than 10%. Most of those with electricity at home live in cities, supplied by grids that were developed in colonial times but which have failed to expand with urban growth. Even many of those connected to the grid suffer from unreliable supplies. So those who can afford them, buy their own expensive diesel fired generators. Yet unreliable rainfall means that hydroelectric production varies even during a good year and is even worse - as at present - during an El Nino event. The main problem is a lack of revenue. Most consumers are unable to afford to pay a commercial rate for electricity. This prevents power utilities from earning enough money to pay for new generation, transmission and distribution infrastructure; generation capacity to produce electricity; transmission to move it across big distances; and distribution to get it into people's homes and businesses. Luckily, a solution may be at hand. The price of photovoltaic (PV) solar power panels is falling, while solar cells are becoming more efficient, so PV is becoming a cost-effective option. Such off-grid solutions avoid the need for expensive transmission and distribution infrastructure. Power Africa is already supporting very small-scale solar PV. It has awarded part-funding to 28 off-grid projects, along with the technical support that small-scale developers often lack. Many more will now follow suit. Power Africa describes the first kWh people gain access to as the "the most valuable" because it provides at least a single source of electric light and the ability to charge mobile phones and radios. With its commitment to providing "cleaner power generation", many of the on-grid ventures backed by Power Africa also involve renewable energy. In some cases, it is directly funding generation projects, such as the 152 MW Sarreole wind farm in Senegal. More often, it will supply technical support and dedicated advisors. It may be that a single grand scheme cannot solve Africa's power problems but Power Africa can help provide local solutions, one at a time.